“Who Else Is Ready To Join The Numbers of People Around The World Who Are Experiencing The Peace, Tranquility And Elevated Level Of Overall Health That Results From Mastering The Power Of The Life Force Energy Within?" Have you asked yourself how much your health is worth to you lately? Is your health even something that you think about on a daily basis? Are you taking the most effective, purposeful actions to ensure that you achieve optimal health? If you answered "no" to any one of these questions, I urge you to stop what you are doing for just a moment and listen to what I have to say as it may add years onto your life or perhaps even save it. And, if you answered "yes", then you should listen to what I have to say because obviously you’re a person who takes their health seriously and you wouldn’t want to miss out on perhaps one of the most essential aspects of health preservation. In Case You Haven’t Heard, Optimal Health Is Truly A Mind-Body Experience And To Focus On One Without The Other Means That You're On A Road To Nowhere Fast! Let’s say you read every single day, have attended some of the most prestigious schools in the world and have spent most of your life enhancing your level of intelligence. If you are not exercising, eating right and taking the same course of action with your body, chances are you’ll die smart, but young. The opposite is true as well, you may live long but wind up unsuccessful and/or with little intelligence. And essential to the relationship between the mind and body is the energy which they share and exchange. When this state is achieved within the body, you become positioned to eliminate the possibility of getting chronic illnesses and to go from an external-centered life to an internal-centered life. It really is like having an unseen advantage in terms of adding years to your life. In other words to do this, Chi must flow freely and openly within you. It must happen through the means of a natural and organic process and sometimes getting that to happen can be challenging. And that’s why I decided to take my 25 + years of helping people improve their lives using the power of hypnotic influence and combined it with my education in cognitive psychology. I created a formula that will enable anyone to unlock the Chi within them and experience the life changing results that come with doing so. 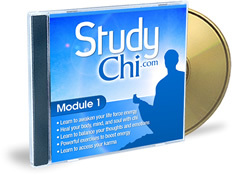 Stage One Chi Awakening - Learn to awaken the life force energy that naturally resides within you. Universal Health Elevation – Here you’ll discover how you can heal your body, mind, and soul with chi. Inner Control Mastery – Here I’ll show you how the Chi will help you to learn to balance your thoughts and emotions. Enhanced Energy – Discover powerful exercises that will catapult your energy levels. The Power Of Directed Karma Attraction – Here you’ll learn to access your karma and reap the rewards of what you’ve sown. This is, hands down, the most effective program ever developed on activating the life-force energy within you using the power of hypnosis. The reason that I make such a huge claim is because within the program are effective hypnosis techniques that will help you achieve the Alpha state so your subconscious can be reprogrammed. It will also provide the profound information needed to unlock the Chi within you. If you are ready to take your health and your life to the next level then don’t waste any more time putting your health at risk. Take action now and repay yourself by adding years onto your life by owning this program today for just $27.97. That’s right, for less than what it costs to visit most doctors, you can regain the balance between the mind, body and spirit that you so desperately need. 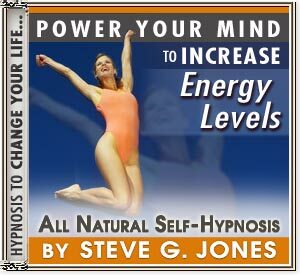 And as an added bonus, I am also going to include my "Power Your Mind To Increase Energy Levels" hypnosis recording. We all want more energy in our lives! There are probably times in your life or during your day when you just don't have the energy to do what you need or want to do. It should not be that way and it does not have to be that way! You deserve to feel energetic in all aspects of your life. Imagine waking up and feeling energized to take on your day. The Increase Energy hypnosis recording will help you get your energy back so that you can feel motivated throughout your day. Hypnosis is a great tool to use to help increase your energy. The hypnotherapy session will first relax you into a hypnotic state and then Steve will use his expertise in giving you powerful suggestions, telling your body it has more energy. Whether you want more energy to keep up with your kids or more energy to work 10 hour work-days, this powerful hypnosis program will give you the energy that you crave! Click Below To Order For Just $47.00 $27.97! Dr. Steve G. Jones, M.Ed. P.S. 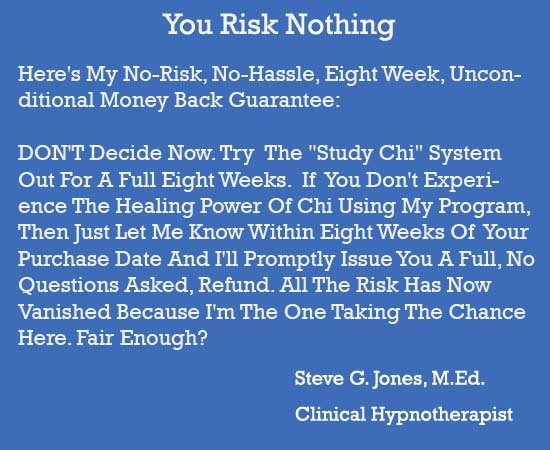 Remember, this is the only hypnosis program that will activate the Chi within you, created by the owner of the largest set of hypnosis recordings in the world, so don’t fall for cheap imitations. P.P.S. – By having the ability to try my program for a full 8 weeks, there is absolutely no risk to you at all. In fact, the only thing you risk is the opportunity to awaken the Chi within you and reap the rewards that come with it. P.P.P.S. – Your health should be your most prized possession so don’t take it for granted. What you do today will benefit you for years to come.